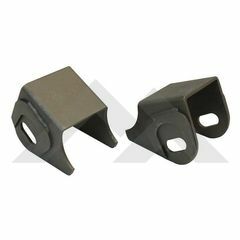 RT Off-Road's Lower Control Arm Bracket Set is a heavy-duty replacement for the failure prone factory mounts. The 3/16″ plated steel construction will ensure long lasting performance even with the most rigorous off-road use. The slotted cam bolt design will allow you to dial in the front caster and improve overall ride quality. Cam bolt kits are available separately (6504238K). Installation will require cutting, grinding and welding. Includes two (2) 3/16″ Thick Brackets (Zero Degree Offset); Designed For Use With Cam Bolts.